It was so cold here today in NJ that all I wanted to do was sit in front of a nice fire. Who doesn’t love a fire? The hypnotizing flames, the intense heat, the smoke…oh the smoke. Speaking of smoke…how about sitting in front of a fire and drinking a Rauchbier. A what you may ask? Why a Rauchbier, which breaks down in German to rauch (smoke) and bier (beer), hence Rauchbier. 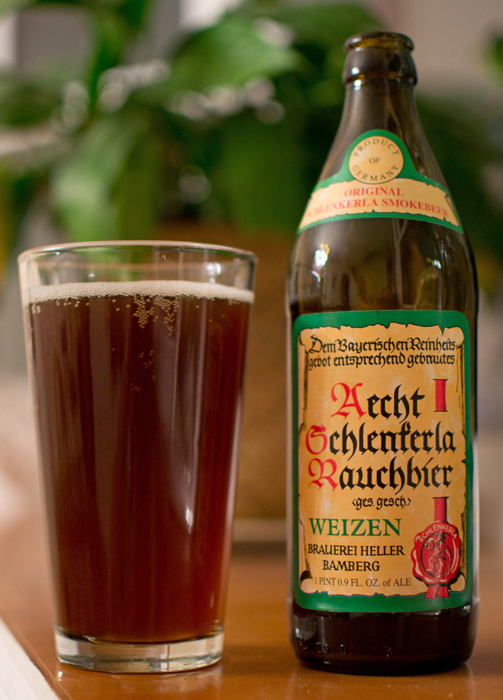 Beer #57 is Aecht Schlenkerla Rauchbier Weizen by Brauerei Heller-Trum/Schlenkerla. Hailing from Germany, this Rauchbier has an ABV of 5.2%. A reddish brown liquid with no head whatsoever stared back at me from the pint glass. I took a smell and it smelled like a campfire. Campfire, liquid smoke (if you cook you may know what this is), the smell of the charred pepper skin when you roast it on the grill, ashes, smoked sausage, a building after it has burned down, I think you get the picture, or aromas in this case. I was a bit reluctant to taste this but I know better than to judge a beer by it’s smell alone. Surprisingly, the smokiness was not nearly as strong in the taste. I was reminded of smoked meats and bacon and sausage and kielbasa in the taste, not overpowering at all, just there along with a nice malt backbone. This was a medium bodied drink that was nice and smooth. As far as being drinkable, for me, once I got past the unusual aromas, it was very drinkable. I found myself wanting another after consuming the 17 oz. that the bottle provided. Wow…this beer or should I say bier was very unique. I have never had anything like it before. To be honest, I really enjoyed it, although I do enjoy my smoked meats, sausages, bacon, kielbasa, etc. I need to try other Rauchbiers as I have heard this is one of the more milder versions smoke-wise. I urge you to give this one a shot, after all, the Germans know a thing or two about brewing beer. As the Germans say…Prost!